First-time buyers house-hunting at Dunville in Navan won't need to trade up in future to accommodate an expanding family - most of the already-large three-beds enable the purchaser to extend into the attic. The biggest three-beds are fitted with attic trusses to facilitate a conversion into a further 450 sq ft space, as long as planning permission is secured. More than 240 of the 298 properties being built at Dunville have been sold since the development was first launched in May 2017. 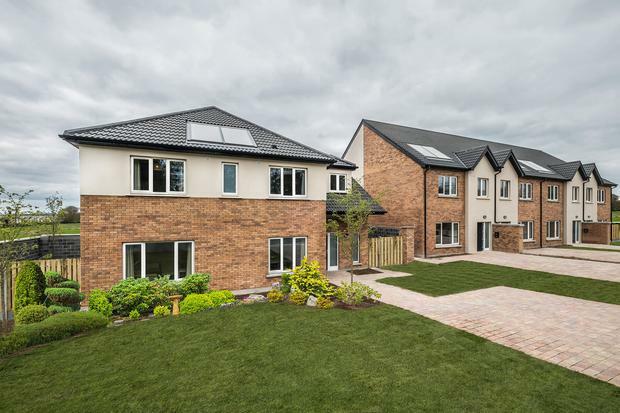 This weekend will see the release of 24 two, three and four-bed homes. Prices in the latest tranche start at €245,000 for a two-bed, semi-detached bungalow, at €264,000 for a three-bed mid-terraced home, at €285,000 for a three-bed semi, and at €380,000 for a four-bed detached style. The exteriors are finished in a mix of brick and render, along with triple-glazed UPVC windows. Inside, the fitted kitchen comes with integrated appliances. The houses have an A3 BER and are within walking distance of two schools. The scheme is a four-minute drive from the M3 motorway. Viewings tomorrow and Sunday, 12pm to 2pm.